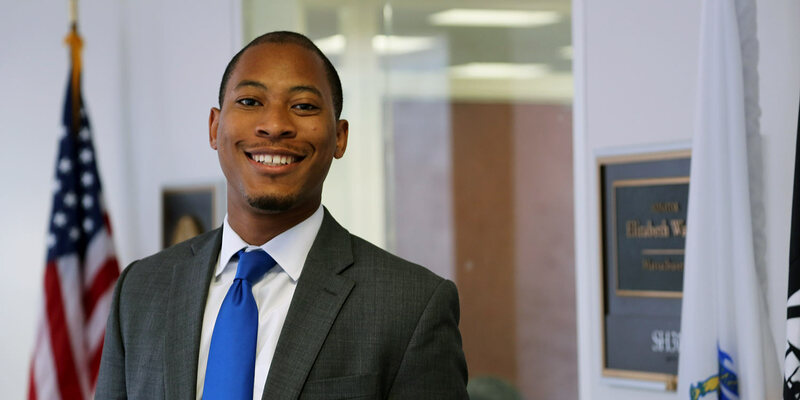 How one alum's commitment to working on education policy issues took him from the classroom to the office of Massachusetts Senator Elizabeth Warren. For Josh Delaney, Ed.M.’14 — senior education policy adviser to Massachusetts Senator Elizabeth Warren — the journey to Capitol Hill was not direct. He went from majoring in journalism, advertising, new media, and theater at the University of Georgia to becoming a high school special education teacher focused on mathematics. Planning to shift his career to education policy, he then enrolled in the Ed School’s Education Policy and Management Program. That’s when, he says, he got really lucky. Now working with Warren on policy around early education, child and foster care, K–12 schools, and higher education, Delaney looks back on his career path and discusses what he finds to be the most pressing issues in ed policy. From your college majors, one wouldn’t think you’d go on to teach math. How did that happen? I was initially not a big fan of math, but now I wouldn’t teach anything else. When you are certified in special education at the high school level, you can wind up teaching anything, in whatever subject area you’re needed, and you pick it up and run with it to best serve your students with disabilities. As a special educator in Georgia, I had amazing colleagues at my school — veterans and masters of their craft that shook up my perception of teaching and helped me understand that teaching math is just teaching kids how to think. And as a special educator, this is one of the most important things I can teach a child — how to think analytically and approach complex problems. What made you leave teaching to pursue a degree at HGSE? I loved being in the classroom and I loved teaching. But, I noticed that there were a lot of influences and forces that had a measurable impact on a student’s success, and were out of my control. The by-products of policy — not just education policy, but immigration policy, for example — had a large impact on students before they even got into the classroom. I had a moment of reflection and decided to go back to school to develop my skills and leadership, to pursue a graduate studies program that I felt would launch me into a new career, to catapult me into education policy like a slingshot. And my time at the Ed School did just that. As part of the Education Policy and Management Program, I got to dive into policy-heavy courses, learning the mechanics: how to write a policy memo, how to conduct research and analysis, [as well as] the key laws and how they are made. When I was in the classroom, I taught in an immigrant community with many undocumented students, and I developed a passion for working with them and a desire for helping to enact change on their behalf. For example, I worked with a valedictorian who checked all the boxes [to succeed in college], but because of the policy in Georgia, he was legally barred from attending my alma mater. There was something fundamentally not right about that to me. Fast forward to HGSE, my adviser Professor Roberto Gonzales taught me to explore policy issues around undocumented students — both immigration and education policies. How is it to work with Senator Warren? It has been an amazing experience working for and with someone so inspiring, someone who cares so deeply about education. Her whole career has been in education before she ran for office; she taught students with disabilities right after college like me, and she was a professor for decades. She really values education. What are some of the big issues you’ve been working on? Any frustrations? I think we need to double down on immigration and education policies to support immigrant students and children of immigrants. Given the political climate these past few months, these students really need a lot of attention and support. We need folks willing to roll up their sleeves and fight for equal educational opportunities for those kids. One of the really interesting policy conversations going on right now is that [Americans] are — still in 2017 — trying to figure how to truly have diverse schools. It’s still one of those nuts we need to crack. Spending time with this question is critically important: Why are schools more segregated today? What can we do to solve that? A lot of folks at the federal level haven’t spent sufficient time in the communities that many of these policies impact. They haven’t spent a lot of time alongside the community, working, volunteering, engaging with folks in communities of color, and low-income communities, so often there is a large detachment and disconnect in the conversations about the policies that are made and the actual realities happening in these communities. What is the climate in D.C. like — from the perspective of someone in the thick of it — on the topic of education? It really does feel like the treadmill got turned on to high speed and we just had to jump on. And with Democrats being the minority in Congress, it has not slowed down. A lot of debates that folks may have thought were settled have been kicked up and turned up to a level 10. There’s a divide on the question of what works for kids and what works for schools at the federal level this has become more sharp and vicious as it has ever been. It is somewhat disheartening, but there is hope too. I don’t think I’ve ever seen as much grassroots energy before. In education, it is really interesting to see teachers, parents, and students — who may depend on federal programs or have strong views on the administration’s education policies — making their voices heard in a way I haven’t seen before. Amid the fighting, there is a groundswell of energy and advocacy happening as well. That’s inspiring.